Communication in the perioperative environment is critical for patient safety and effective teamwork. Team members need to know the name of the patient, scheduled procedure, patient precautions and allergies, along with names of team members working together for a given case. 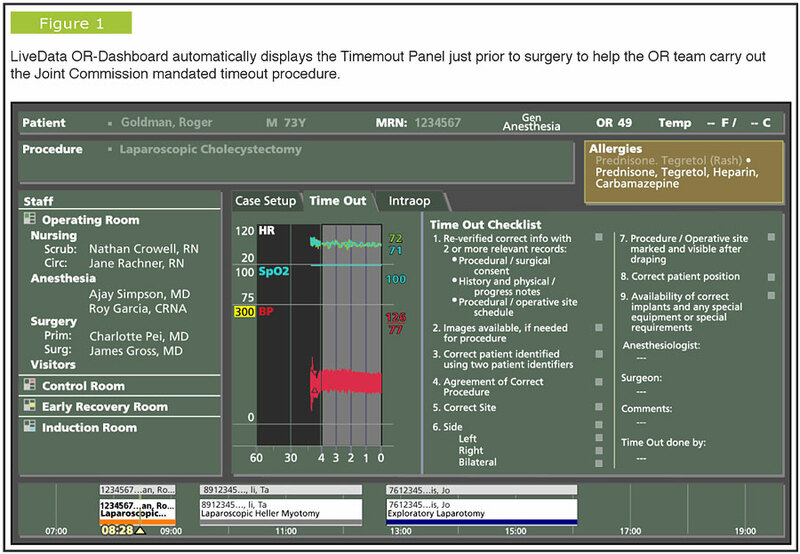 Over the past several years, Massachusetts General Hospital (MGH) developed an intra-operative dashboard in collaboration with LiveData (Cambridge, Massachusetts) to aid in the Timeout/Universal Protocol process as well as provide these critical communication elements (Figure 1). Click here to view a larger version in a separate window. Frontline clinicians imagined this type of communication would be beneficial if extended to the PACU environment to allow easy communication to the PACU staff and improved handoffs. In the typical environment, advance communication from the OR to the PACU often consists of a phone call upon completion of the case. The call alerts the PACU that the patient is nearly ready to leave the OR for the PACU and provides information related to the stability of the patient and any special needs the patient may have. If the patient requires more care than anticipated, nurses may need to reorganize assignments among themselves and find additional resources to provide appropriate patient care. Given this window into the OR, PACU nurses have transformed their work style from reactive to proactive. With a more comprehensive awareness of incoming patients, the nurses in the Pod find that they are able to deploy resources, allocate staff, communicate with members of the OR team, and manage hand-offs more effectively. These improvements have reverberated positively throughout the Pod's perioperative chain and have contributed to PACU staff satisfaction. While the Pod PACU is smaller and in closer proximity to the ORs than the main PACU at MGH, the Pod configuration approximates hospital plans for future PACUs. Response to the dashboard, therefore, provides insight into implications of widespread installation. Simply knowing the surgical procedure that a patient has been undergoing, along with continuously updated physiology, case milestones, and team members, is a novelty for PACU nurses and useful for anticipating work. A hemodynamically stable patient with a knee replacement, for example, has less potential to need extensive attention than a gastrointestinal case in which the patient shows hemodynamic instability. Viewing one surgical patient within the context of other incoming patients provides this higher level of awareness, often referred to as "situational awareness." Three incoming patients with more potential for hemodynamic instability demand a very different set of resources than three stable patients. PACU nurses in the Pod have increasingly turned to information on the dashboard for clues as to whether incoming cases have the potential for instability. When able to anticipate them, PACU nurses will prepare medication in advance, reorganize staff assignments to retain one-on-one nursing, and ensure that the patient is being transported to the appropriate PACU, as high acuity cases are triaged to the main PACU because the Pod is not designed to accommodate them. While the policy at Massachusetts General Hospital is that in cases of severe instability the patient remains in the OR until stabilized, much can happen as the patient is emerging from anesthesia and transported from the OR to the PACU. PACU nurses remain constantly on alert for the patient who is expected to arrive stable, does in fact arrive stable, but who then decompensates shortly thereafter. For all cases done in the Pod, PACU nurses study the dashboard's physiologic trends, taken directly from the patient monitors in each of the ORs. Observing heart rate, blood pressure, and oxygenation provides insight into how well the patient is tolerating surgery. A drop in blood pressure while a patient is being intubated or undergoing anesthesia induction is not unusual. But repeated periods of hypotension during surgery will capture the attention of the PACU nurse as it suggests a pattern that may continue in the PACU. When anticipating potential hypotension, for example, the PACU nurse can prepare the patient slot with a bag of a neosynephrine, a routinely used drug, and have it ready when the patient enters. Drug preparation is a significant activity for the PACU nurse. The ability to prepare in advance not only impacts PACU workflow but can also affect the work of OR staff. All medications are readily available in the PACU, but carrying out such steps as getting the medication, creating the mixture, and setting up the infusion in the appropriate PACU slot prior to patient arrival improves workflow efficiency. The sooner the PACU nurses can hang an infusion, the sooner they will be ready to allow transport from the OR to the PACU, accept the transfer of care from the OR team, and provide uninterrupted postoperative care. A 10- or 15-minute delay in moving a patient in or out of the PACU, particularly in the morning, can considerably impact the OR schedule. Having equipment and medication ready for the patient upon arrival saves time for both PACU and OR staff. Even more important for minimizing delay is ensuring that a bay is emptied, cleaned, and ready to admit a new patient when needed. Operative milestones shown on the dashboard serve as a heads up, so that staff can ensure availability of a PACU bed when the next surgical case is ready to proceed. Providing a smooth surgical experience for the patient and maximizing OR efficiency involves aligning the entire perioperative process. This is the premise behind the MGH Pod Project, a direct outgrowth of lessons learned in the hospital's Operating Room of the Future (ORF). Developed in collaboration with the Center for Integration of Medicine and Innovative Technology (CIMIT), the ORF is a living laboratory for evaluating the impact of new technology on clinical work processes. Accurate data capture and analysis, multidisciplinary teamwork, and thoughtful integration of technology are the building blocks of the ORF. The Pod extends these principles of the ORF to three other operating rooms, each of which includes an adjoining induction room as well as the dedicated satellite PACU unit. Studying the impact of the configuration on OR efficiency, including the effect of "parallel" as opposed to "serial" processing, is a key objective of the Pod project. The dashboard therefore includes a Next Patient Here field, which informs PACU staff when a patient is in the induction room of a given OR and will soon be ready for surgery. This helps them prioritize when admitting incoming patients to the PACU. For example, if operative milestones indicate that two ORs hold patients soon to emerge from anesthesia and only one has a patient waiting in the induction room, PACU staff are aware that the one OR has a more urgent need to move its patient out than the other and will assign the next bed accordingly. Including the Next Patient Here field on the dashboard display involved creative integration of an RFID technology. The operating room suite was previously wired for RFID tracking and simple transmitters were installed in the patient induction rooms. 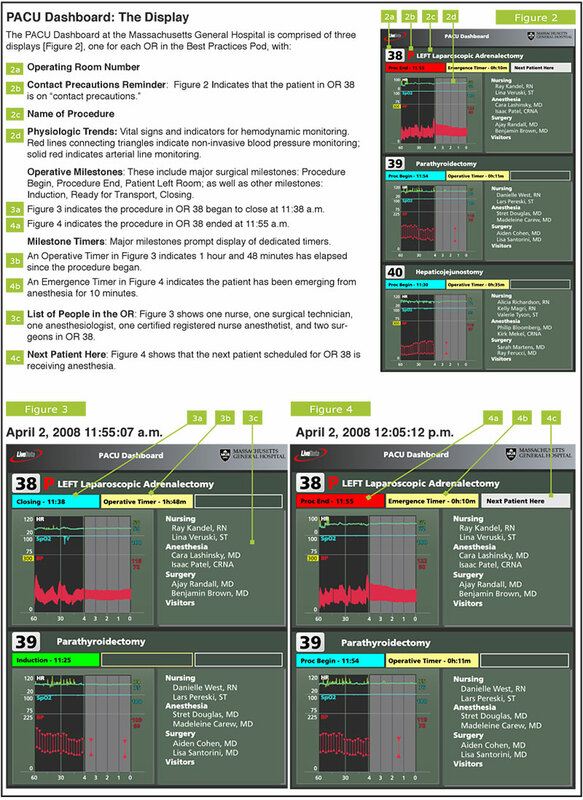 Transport personnel in the OR activate the transmitter when a patient is delivered to an induction room, thereby automatically triggering the PACU Dashboard to display Next Patient Here. Operative milestones are automatically pulled from perioperative nursing, OR scheduling, and anesthesiology information management (AIMS) systems. Interfaces to these disparate systems, along with one to the physiologic monitor, had already been integrated by LiveData for implementation of LiveData OR-Dashboard in the ORF. MGH therefore turned to LiveData, with whom it had developed an ongoing technological and clinical partnership, to develop the new PACU Dashboard for the Pod. With the LiveData technological foundation in place, implementing the PACU Dashboard was straightforward work. 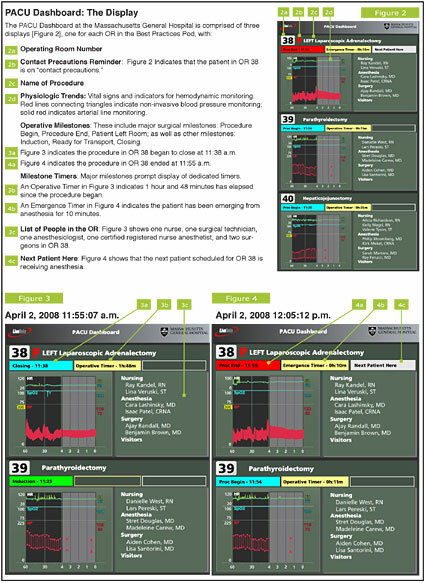 The same principles that apply to the OR-Dashboard display were carried over to the PACU Dashboard. Flexibility and an emphasis on easy-to-read visuals characterize both dashboards. Like the OR-Dashboard, the PACU Dashboard automatically provides the entire team with ready access to crucial information when it is most useful for promoting actions that directly reinforce patient safety and perioperative efficiency. It functions autonomously, requiring no keyboard or mouse as it automatically updates itself with the latest relevant information. Both dashboards are patient-centric communication tools designed to promote teamwork and a culture of safety by facilitating the flow of information among caregivers and between care teams. Making the same information visible to all interested parties facilitates awareness, and significantly, prompts questions. Physiologic data shown on the PACU Dashboard acts as a trigger for further exploration into what actually happened hemodynamically during surgery. The PACU nurses may question OR staff during the procedure, particularly if there is concern that the patient could require transport to the main PACU or ICU. The PACU nurse in the Pod is, therefore, now playing a greater role in initiating the exchange of information with the OR. The more the OR and PACU teams communicate with one another, the more likely that relevant information is maintained during patient transfer. Investigating causes for hemodynamic instability is particularly beneficial when a patient may demonstrate some instability, but not to a degree that would prompt the OR to alert the PACU. Witnessing repeated hypotension on the OR physiologic monitor, for example, the PACU nurse may question OR staff before preparing an infusion. In carving out a more proactive role, PACU nurses are, in fact, initiating a cultural shift both internally and on an interdepartmental basis. This is a case of new technology driving change not out of necessity but as a result of opportunity. The dashboard elicited a unanimously positive response from the PACU nurses. It came as a welcome adjunct that fit naturally into the PACU environment. Because the dashboard speaks the language of PACU nurses (the physiologic trends being "a picture that speaks a thousand words" for them), they learned how to benefit from it with little to no instruction. The ease, speed, and thoroughness with which the nurses chose to incorporate the dashboard into their work methods in the Pod suggests that, given the appropriate infrastructure, a real-time window into the OR meets an unrealized need. Scott Ciesielski is the nursing director for post-anesthesia care at Massachusetts General Hospital. His area of accountability includes inpatient and ambulatory post anesthesia care for adult and pediatric services. Currently involved in the design and development of a significant perioperative expansion at MGH, Ciesielski is collaborating to devise information systems that support patient safety and surgical throughput. He can be contacted at sciesielski@partners.org. Bethany Daily is the administrative director, perioperative business & information services at Massachusetts General Hospital.�She can be contacted at bdaily@partners.org. Wilton Levine is the clinical director for the department of anesthesia and critical care at Massachusetts General Hospital, overseeing the clinical activities in 50 operating rooms.�He has a particular interest in patient safety, communication, hand-offs, and the interface of these activities with national regulatory efforts, as well as in simple, system-wide technological solutions to common challenges. Sandberg, W. S., Canty, T., et al. (2006). Financial and operational impact of a direct-from-PACU discharge pathway for laparoscopic cholecystectomy patients. Surgery. Sandberg, W. S., Daily, B., Egan, M., et al. (2005). Deliberate perioperative systems design improves operating room throughput. Anesthesiology. Stahl, J. E., Sandberg, W. S., Daily. B., et al. (2006). Reorganizing patient care and workflow in the operating room: A cost-effectiveness study. Surgery. Stahl, J. E., Egan, M. T., Goldman, J. M., et al. (2005). Introducing new technology into the operating room: Measuring the impact on job performance and satisfaction. Surgery. Meyer, M. A., Levine, W. C., et al. (2007). 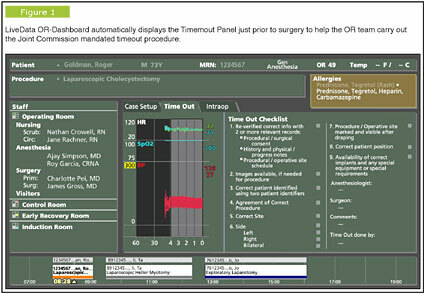 A computerized perioperative data integration and display system. CARS.